Combine hands-on fun with scientific investigation using this action-packed collection of 100 simple science experiments. Use easily-sourced materials to make crystals, electrical circuits, kaleidoscopes, balloon rockets, and much more. Internet links go to specially selected websites with more activities, and contents and index pages are included. One hell of a starting point for parents hoping to show their kids some really cool and simple examples of science in action. Combines hands-on fun with scientific investigation and covers all areas of science, even simple genetics! It includes a glossary and internet links to recommended websites with lots more experiments and activities. I absolutely adore this book. There are lots of old favourites but plenty of new ideas too, such as how to make your own compass (I wouldn't rely on it for real orienteering) and weather vane. If your child is inquisitive, this will be a godsend over the summer - especially fab as it uses completely basic household objects. 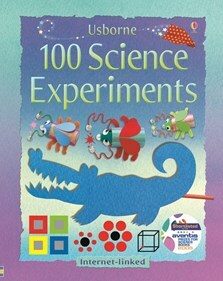 This fun and colourful book contains lots of simple science experiments. Most of the experiments can be done with everyday household objects and many children can do them on their own. Contains clear step-by-step instructions, illustrations and an explanation of what’s going on. Got it from a local library really good, brain tester! I got this book for a birthday (the 2nd of may) and although its a bit young for me now I find things to do in it. I like science so I have at least 15 books on science but this is my favourite. GET IT NOW! This book is hot. I used it for a science fair project. I love this book.